What does a biomonitoring project involve? Biomonitoring is a way to measure the chemicals in a person's body. It can tell us which chemicals are getting into people and at what levels. 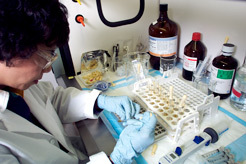 Scientists usually test for chemicals in samples of blood and urine. There are only a few labs that can do this testing. 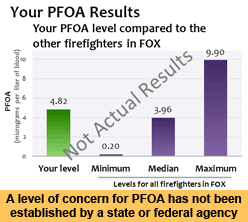 Biomonitoring California conducted a project to test firefighters in Southern California. This project will help us learn more about the chemicals that firefighters are exposed to. Biomonitoring California is a state government program that measures environmental chemicals in Californians. It tracks how the chemical levels change over time. Biomonitoring California also helps evaluate how well government programs protect the public from harmful chemicals. Firefighters and pregnant women are examples of specific groups of people Biomonitoring California has studied. A Scientific Guidance Panel advises Biomonitoring California on new and ongoing projects and specific chemicals for biomonitoring in California. Scientific Guidance Panel meetings are open to the public. We come into contact with many chemicals each day. 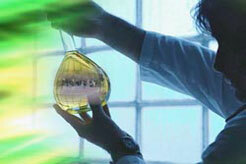 They are used to make many common products, such as cosmetics, plastics, cleaning products, and electronics. Many chemicals measured in biomonitoring studies are used in consumer products, industry or agriculture. Some of these chemicals get into our air, water, soil, dust, and food. We may have more or fewer of these chemicals in our bodies—depending on the products we use, the jobs we do, the food we eat, and the places we live. Chemicals from the environment can get into our bodies through our skin and when we eat, drink and breathe. Young children can be exposed when they touch things, like dusty floors, and then put their fingers in their mouths. Children are also exposed from chewing on items, like keys and toys. Chemicals can be passed from a mother to her baby in the womb. Dioxin, a by-product of industrial processes and garbage burning. Persistent chemicals can build up in people's bodies from different sources. They can be in foods we eat, like animal fat and farmed fish. Some persistent chemicals have been used in consumer products. 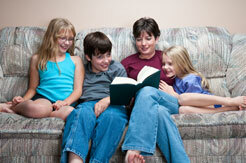 For example, flame retardants are in the foam in furniture and the plastics of some electronics. As these products age, the flame retardants get into dust that we breathe. Some of the chemicals that get into our bodies, such as from environmental pollution, can harm our health. These chemicals can cause cancer, birth defects, learning problems, reduced fertility, high blood pressure, and other conditions. They can also make health problems — such as asthma — worse. Whether a chemical causes health problems depends on how toxic the chemical is, how much a person takes in, and how long a person is in contact with the chemical. We know a lot about the effects that some chemicals have on our health. Cancer: Arsenic, cadmium, lead, mercury, PAHs and PCBs are chemicals known to cause cancer. 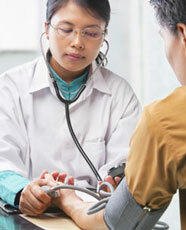 Heart disease: Exposure to lead over many years can increase blood pressure and cause heart attacks and strokes. Learning and developmental problems: Lead and mercury can affect brain development and cause learning disabilities and behavior problems in children. Lead and mercury can also cause memory loss and affect nerves and muscles in children and adults. Reproductive problems: Lead, mercury, and PCBs can reduce fertility and increase the risk of miscarriage. There are tens of thousands of chemicals in use today. Many of these chemicals have not been well studied, so we don't know if they affect our health. Finding out about the possible health effects of chemicals can take years of research. Even when we have evidence that a chemical may cause a particular health effect, we often don't know what level in people's bodies would be harmful. Like other parents, Tony wants to protect his son's health. "We need to learn which chemicals our kids are exposed to." Do some people have higher chemical exposures than other people? Are certain chemicals contributing to the development of disease? Do regulatory efforts, including bans or phase-outs of chemicals, actually reduce exposures among Californians? Ultimately, information from biomonitoring can be used to help keep harmful chemicals out of our environment and the products we buy. 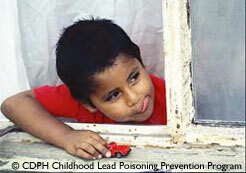 For many years we have known that lead was harmful, especially to children. But the sources of exposure were only partially understood. In the 1960s, scientists conducted biomonitoring of children's blood for lead. They found especially high levels of lead in children living near freeways. These findings had an impact on public policies. Lead was phased out from U.S. gasoline beginning in the 1970s. Lead was also banned in 1978 from paint used in houses. Average lead levels in children have dropped significantly since lead was removed from gasoline and paint. But children who live in older houses are still exposed to lead from peeling paint, dust and soil. Public health efforts to reduce lead exposure continue. The pesticide DDT is a persistent chemical no longer used in the U.S. It was widely used on agricultural crops and for mosquito control until 1972, when the U.S. government banned its use. Because of its wide use, DDT spread throughout the environment. It takes a long time to break down. People can still be exposed, mainly through eating high-fat meat, fish, and dairy products. Biomonitoring helps us track levels of DDT in people as these levels decline over time. Chemical products and processes can be designed in a way that reduces or eliminates the use or generation of hazardous substances. This is referred to as “green chemistry”. Biomonitoring can provide important information for these efforts by telling us which chemicals are getting into people and at what levels. Researchers in the forefront of green chemistry can use biomonitoring data to help identify chemicals to avoid in the design of new products or processes. Anna was asked to be part of a biomonitoring project with other pregnant women. They are being tested for chemicals that might affect hormones and child development. Each Biomonitoring California project examines certain chemicals and groups of people. 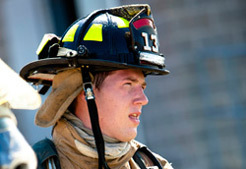 The project may focus on just one or two groups of people, such as pregnant women and their newborns, or firefighters. What happens if someone is asked to be in a biomonitoring project? The person agrees to be in the project and signs a consent form. The person answers questions about products used and places worked. This information helps researchers figure out how the person may have come into contact with the chemicals being measured. Samples of blood, urine or other specimens are collected and sent to a biomonitoring lab, which will test the samples for specific chemicals. Participants can choose to receive their results. Each person's results are confidential. Results are NOT sent to employers or health insurance companies. 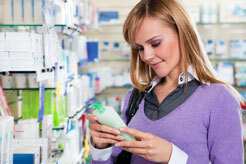 This shopper is checking the label to see what chemicals are in the product. Biomonitoring information can help us learn more about chemical exposures in our communities and what actions we might take. Biomonitoring information can help us evaluate how well government programs are reducing exposures to harmful chemicals. Participants can learn about some of the chemicals they have been exposed to and possible ways to reduce their exposure. Participating provides valuable information for science and public health. This is a sample chart showing biomonitoring test results. The chemical may be harmful to people's health. People are likely to come into contact with the chemical. The chemical stays in the environment for a long time and can build up in people's bodies. The Scientific Guidance Panel helps Biomonitoring California choose which chemicals to measure. Fish caught in the San Joaquin River are high in mercury, which got into the river due to gold mining in the past. 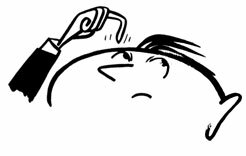 Mercury is measured because it can harm brain development and cause other health problems. Mercury is released into the environment when coal is burned, by some industries, and from past use in California gold mining. It enters our air and water, and gets into fish that we eat. Other metals measured by Biomonitoring California include arsenic, cadmium and lead. Biomonitoring projects often measure pesticide levels in people. Many pesticides can be harmful to people. 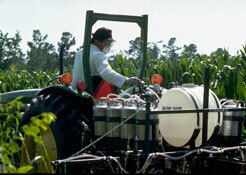 Pesticides are widely used in homes, yards, farms, parks, and on pets. Chemical flame retardants (such as PBDEs) are in the foam in furniture and in cars, electronics, children's car seats and many other products. They get into the air, dust, and food. Phthalates are added to vinyl to make it soft and flexible. Products containing vinyl include shower curtains, flooring, school binders, some modeling clay, #3 plastic, medical tubing, and tubing used in food processing. Phthalates are also in some nail polish and scented products, like air fresheners.